One of the basic teachings in minimal access surgery is that haemostasis takes precedence over everything else as vision is the key for any minimally invasive procedure. There may still be laparoscopic surgical situations where haemorrhage will occur, and in fact, they are the second most common complications in laparoscopic surgery with the incidence varying from 0.2% to 1.1%. This can be a very challenging as well as intimidating situation for any laparoscopic surgeon. Although open surgical conversion becomes an imminent option in these situations, many of these situations can be salvaged using a ‘rescue stitch'. Rescue stitch is specially designed stitch meant for laparoscopic use, which can be used to salvage bleeding is laparoscopic surgery. Abreu et al. described a stitch used for retraction of median lobe in robotic radical prostatectomy and Sotelo et al. 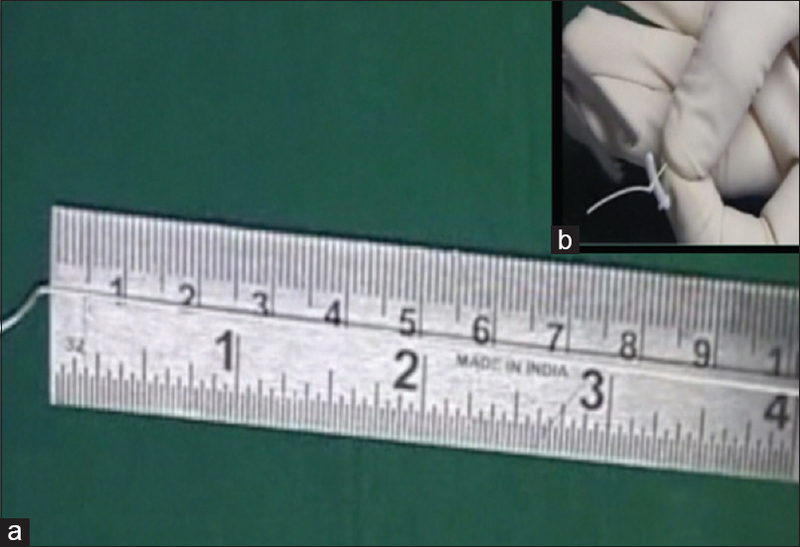 referred to a similar stitch in the management of robotic surgical vascular injuries during radical prostatectomies.,, Rescue stitch is a part of ‘rescue tray’ which contains other ancillary aids which can be used to control haemorrhage in laparoscopic surgery. 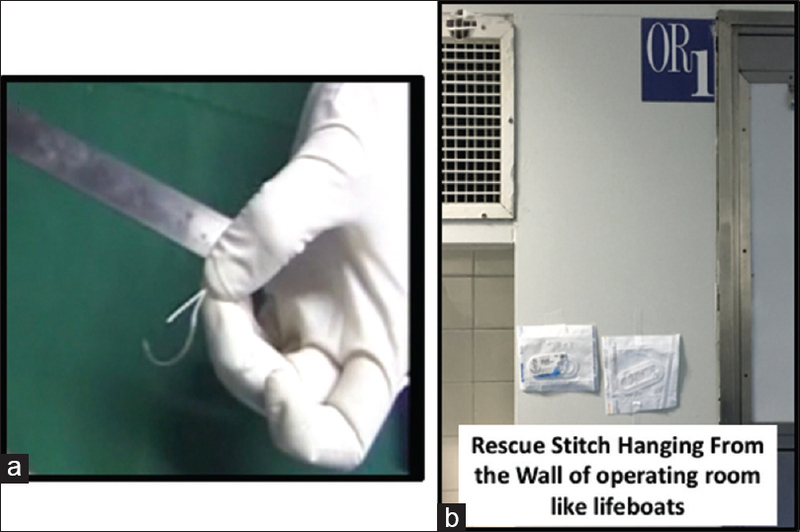 We, herein, describe rescue stitch along with a rescue tray and its application during intraoperative bleeding in minimal access surgery. Rescue stitch is prepared using four inches of polyglactin 0 on CT-1 needle or polypropylene on 3-0 or larger thread and 20-mm needle is used [Figure 1]a. It is important that needle of larger configuration is used as smaller needles may not be visible in pool of blood. When used in robotic surgical settings, smaller needle can be used as it can be relatively easily handled with articulated wrist movements of the robotic instruments, and also, assistant is in a more ergonomic position to do suction and give operating surgeon a better surgical field. Four inches of suture is an ideal length as longer lengths of sutures are difficult to handle in minimal access milieu. A knot is tied at the end of the suture [Figure 1]b and Weck™ (Teleflex, NC, USA) clip is applied proximal to it; the thread is now again tied over the clip, this prevents slipping of the clip and helps it in sinching the opening in the vessel. There are devices such as LAPRA -TY™ (Ethicon, USA) available which prevent slippage of the suture. However, these devices are not suitable for use in the repair of vascular injuries as they have a smaller surface area as compared to the flat surface of a medium or large Weck™ clip. Furthermore, a separate LAPRA-TY™ (Ethicon, USA) applicator has to be bought along with LAPRA-TY™ (ETHICON, USA) which is costly and difficult to procure with limited utility. Once prepared, the rescue stitch is plasma sterilised and stuck to the wall of the operating room. It hangs from the wall like a surgeon's lifeboat, ready to be used in a matter of seconds [Figure 2]a and [Figure 2]b. Its location should be such that it should be easily accessible and visible not only to the circulating staff nurse but also anybody who is available in the operating room. 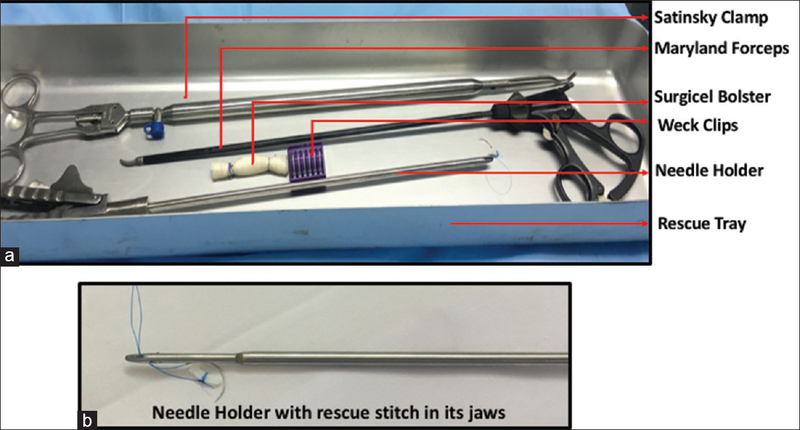 Rescue tray comprises of a laparoscopic needle holder, and a rescue stitch can be placed in the jaws of the needle holder, so that it is ready for immediate use. The second component of the rescue tray is a Maryland forceps, suturing of a bleeding vessel requires precise holding of the vascular edges which can be best done with a laparoscopic Maryland forceps. The third and a very important component of a rescue tray is laparoscopic Satinsky clamp. This clamp can be used to cross-clamp bleeding vessels or areas. It can also be used to temporise major bleeding till the time open conversion is planned. This tray must contain a cartridge of Weck™ clips and a Surgicel™ (Ethicon, Somerville, USA) bolster. The Surgicel™ bolster can be packed into the bleeding area to achieve temporary haemostasis, till the time, rescue stitch and instruments are organised. After bleeding has been identified, proper exposure should be achieved. This can be done by placing additional ports for suction and retraction. Once rent in the vessel is identified, rescue stitch is passed through both the walls of the bleeding vessel [Figure 4]a and [Figure 4]b. Once the needle is passed, the rent in the vessel is sinched with the Weck™ clip applied at the end of rescue stitch. This significantly reduces the bleeding and improves the field of vision. At this point, the Weck™ clip or the suture is held on traction with non-dominant hand so that the vascular walls are well visualised and another throw is passed making it a figure-of-eight stitch. The two ends of suture are tied to one another to achieve complete control of bleeding. The end with Weck™ clip is cut and the clip removed. In situations, when bleeding is torrential, time is critical and ports are not ergonomically placed, another Weck™ clip can be sinched over the suture to stop the bleeding and left in position. Lifting the bladder during ureteric reimplantation. Rescue stitch and rescue tray are easy to prepare and can help surgeon salvage bleeding in minimally invasive laparoscopic surgeries. We would like to thank Mr. Mahesh Patel, operation theatre technician for helping us develop this stitch and tray. Castillo OA, Peacock L, Vitagliano G, Pinto I, Portalier P. Laparoscopic repair of an iliac artery injury during radical cystoprostatectomy. Surg Laparosc Endosc Percutan Tech 2008;18:315-8. Barbosa Barros M, Lozano FS, Queral L. Vascular injuries during gynecological laparoscopy – The vascular surgeon's advice. Sao Paulo Med J 2005;123:38-41. Abreu AL, Chopra S, Berger AK, Leslie S, Desai MM, Gill IS, et al. 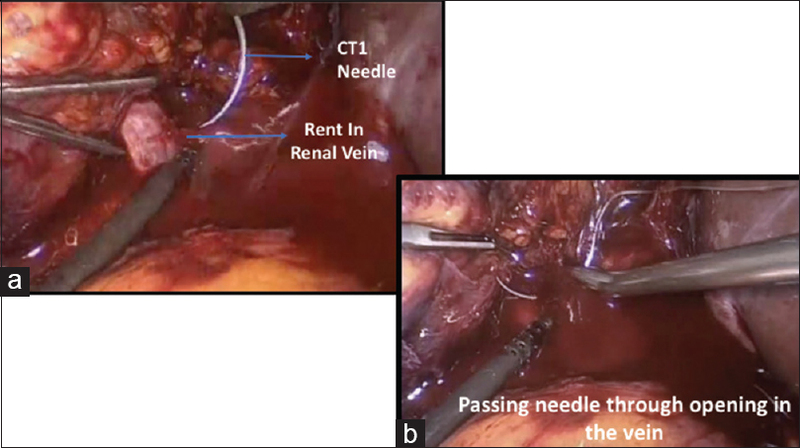 Management of large median and lateral intravesical lobes during robot-assisted radical prostatectomy. J Endourol 2013;27:1389-92. Sotelo R, Nunez Bragayrac LA, Machuca V, Garza Cortes R, Azhar RA. 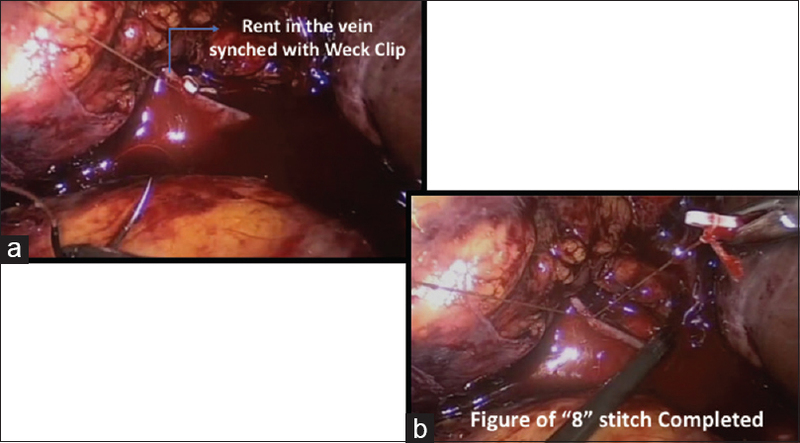 Avoiding and managing vascular injury during robotic-assisted radical prostatectomy. Ther Adv Urol 2015;7:41-8.